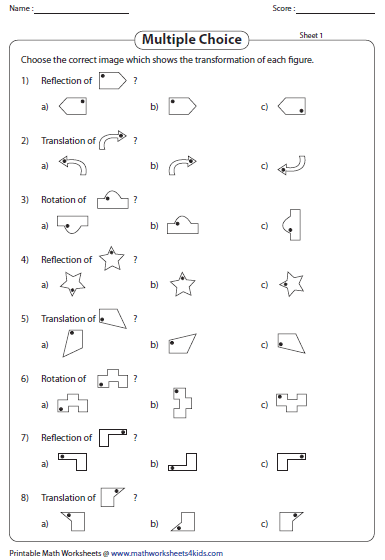 Transformation worksheets contain skills on slides, flips, turns, translation, reflection and rotation of points and shapes. In addition, writing the coordinates of the transformed shapes and more are included. 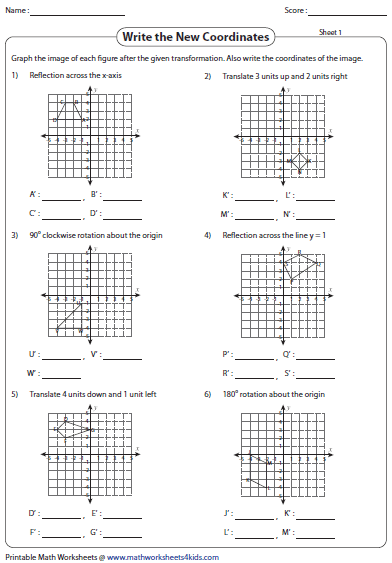 In these worksheets identify slides, flips and turns of the given figures. Also move the shapes as illustrated and graph them. 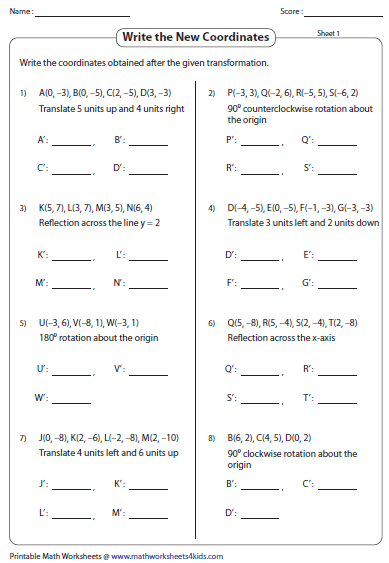 Translation worksheets have ample skills to translate points and other shapes, writing the coordinates of the translated shapes and MCQs based on it. 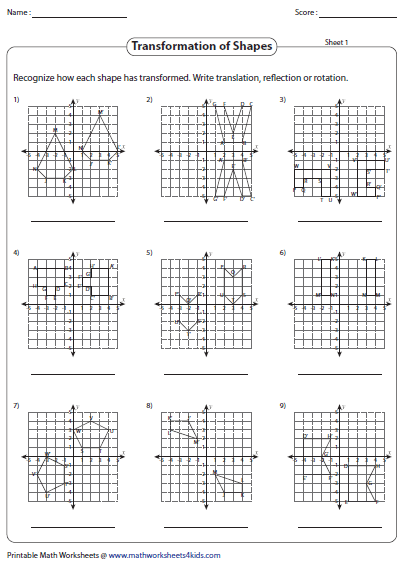 Rotate points and shapes in clockwise and counterclockwise direction and graph them in these rotation worksheets. Reflect the given points and the figures across the x-axis, y-axis and also across the line x = a and y = b, where a and b are parameter. 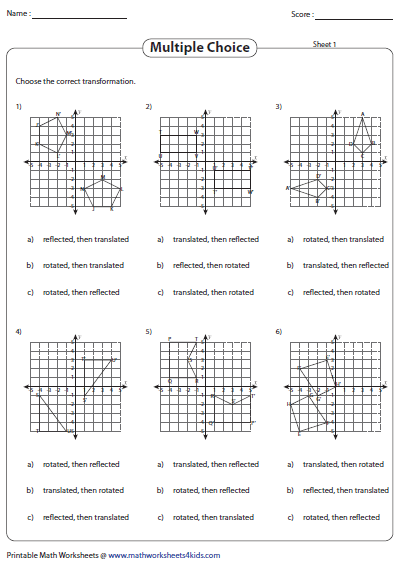 A mixed review of problems on the concepts of translation, reflection and rotation with exercises to identify the type of transformation, transformation of shapes, writing the coordinates of the transformed shapes and more are included in these worksheets. 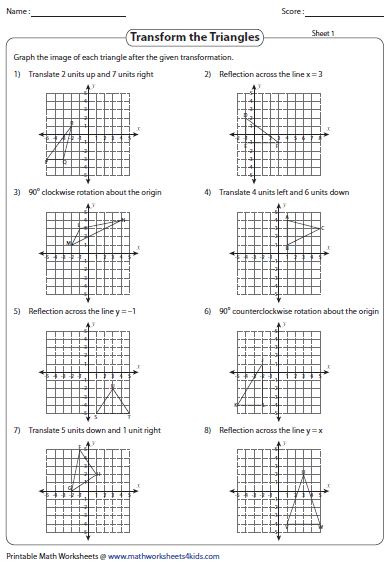 Printing Help - Please do not print transformation worksheets directly from the browser. Kindly download them and print. 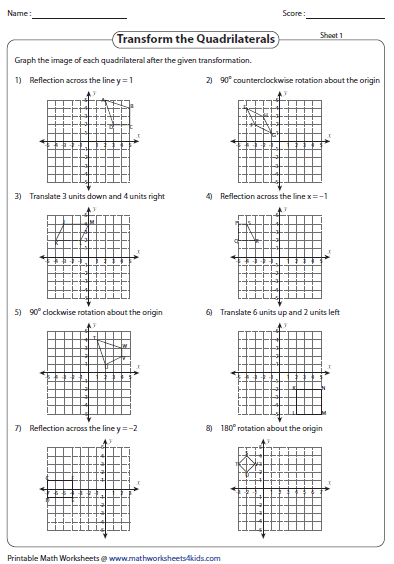 In these worksheets identify the image which best describes the transformation (translation, reflection or rotation) of the given figure. Each grid has the figure and the image obtained after transformation. Write, in each case the type of transformation undergone. 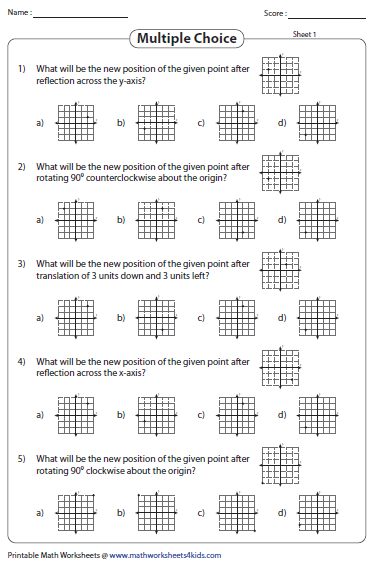 Rotate, reflect and translate each point following the given rules. Choose the correct image of the transformed point. The coordinates of a point are given. Perform the required transformation and check mark the correct choice. 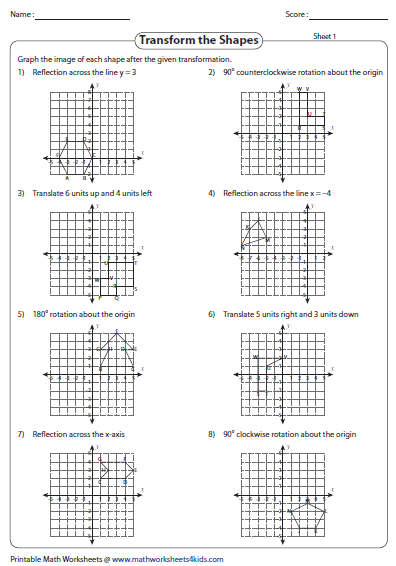 Translate, reflect or rotate the shapes and draw the transformed image on the grid. Each worksheet has eight problems. Draw the transformed image of each triangle. The type of transformation to be performed is described above each question. 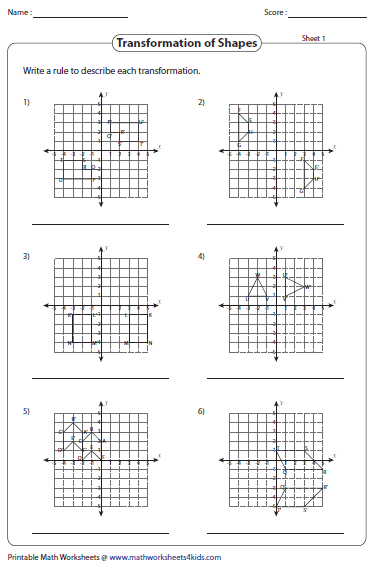 Translate each quadrilateral and graph the image on the grid. Label the quadrilateral after transformation. Two types of transformation have been performed to each figure. Choose the correct transformations undergone. Identify the transformation undergone by the figure and write a rule to describe each of them. Perform the required transformation for each figure and graph it. Also write the coordinates of the image obtained. The coordinates of the figure are given. Write down the coordinates of the vertices of the image after transformation.